Meanwhile, Honourable Myron V. Walywn (AL), Minister of Education and Culture, referred to the students as “digital natives”, while adding that the new educational system will improve academic performance. “The children in our education system are undoubtedly digital natives. A digital native is a person born or brought up during the age of digital technology and so they are very familiar with the computer and the internet from a very early age,” adding that if the internet goes down the children behave as if the “world is coming to an end” which was followed by an outburst of laughter from the audience. He further stated that the education system must go in the technological direction in order to prepare the Virgin Islands (VI) students for life after schooling. “This is what they know and this is how the world operates. Our students today learn differently than those of yesteryear and we cannot allow the antiquated ways of disseminating information in the classroom to disadvantage our young people that require creative teaching methods. Today we are proud to launch the device,” expressed Hon Walywn. Grades 7 and 8 students will have access to subjects such as Mathematics, English, Spanish, Social Student, Religious Education, Science and Physical Education, where the curriculum was created by teachers at the Elmore Stoutt High School. 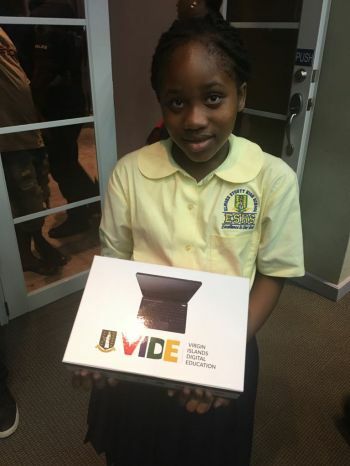 According to Dr Lavon Chalwell-Brewley, Deputy Chief Education Officer, the overall cost of the device is $199, but parents are required to pay a subsidized annual fee of $125 at the beginning of the school year, noting that the device will be returned when the school year has come to an end. Parents and students are responsible for the care of the device, but if the device is damaged beyond repair or stolen, the parents will have to pay the full cost of $199 to replace it. However, if the device was accidentally damaged such as broken screen or missing keys, the parent will be charged a repair cost depending on what type of damages occured, while if it has a manufacturer defect, the Ministry will repair or replace the digital textbook. The digital textbook will be monitored with the help of FortunaPix, the Department of Information Technology and the Ministry of Education’s ICT unit. Ms Lauren Welch of the Information and Communication Technology Unit stated that each device comes with a number that is specifically assigned to each student. Furthermore, she revealed that the device can be used offline and is not dependent on the use of the internet, while adding that no student can access other websites unless authorised by a teacher. Ms Welch disclosed that her department can monitor everything that each student does on the device and this is done in order to ensure the safety of the student. It is time to stop the madness and approach education on a bipartisan basis. Good story vino. VIDE will make learning in the BVI easy. The most important thing that people in power seem to never understand is that you can stretch the rubber only so far. It is eventually going to break and that day when the masses revolt is not too far off in future. When that day comes, each one of the people complicit in these unBVI actions will be handed over swift justice.